Whether you are graduating from high school or college, the rite of passage offers an amazing way to express your unique self and tell your story. How? A clean slate of cardboard and fabric serves as your art canvas to share with the world whatever you want to say. You’ve sat in hours and hours and hours of classes intaking everything they had to give you. Now is your time to let it out. Create. Express. Speak! Decorating a graduation cap can be as different and unique as the millions of different personalities out there. You can be silly. You can be serious. From a simple message of “Hi Mom!” to a complex geo-political commentary, the platform is yours. That is, you have about a 12 x 12 square foot of billboard space. So, have at it! By the way, we love, loVE, LOVE people who share their stories. We think everyone has a story to tell. That’s one of the reason we love class rings (by the way, if you don’t have a ring yet for graduation, hit us up. We offer a low price guarantee on Artcarved rings. So, we are the cheapest online. AND, you can get your ring for free, win $100s in gift cards or even $10,000. Pretty cool right?) Shameless plug over. Seriously though, the graduation cap decorating and a class ring share some similarities. They both allow you to express yourself. Now is a time to celebrate. Now is a time to commemorate your achievements and all of the hard work you put in towards this moment. Now is a time to both cherish the past and look forward to the future. For real, graduation is awesome. So, without further ado, here are some tips and ideas on how to make the most of decorating your graduation hat. 1. Brainstorm – Yes. You learned to do this in 2nd grade. Truth is, brainstorming never stops being valuable. Before you go all Martha Stuart on your hat, take a moment to pause, sit, and think. What do you want your hat to say? What is your theme? Funny? Serious? Attention grabbing? Whatever you decide, take a moment to brainstorm and think of some different ideas. 2. Choose What Tells Your Story – You are you, and no one else has the same story as you. So, be unique! With your hat, you can do whatever you want with it. Your hat will be seen by 100s if not 1,000s of people. So, consider what it is about your story you want to share. What describes you? Cheerleader? Student Government? Soccer player? Comedian? Poet? Musician? Whatever your story, you get to tell it. 3. Pinterest Rocks for Ideas – Ok, so I’m a dude, but I have to give it up to Pinterest sometimes. If you’re like me, you may not be the most artsy of people. Your teachers call it plagiarism. I call it creative research. 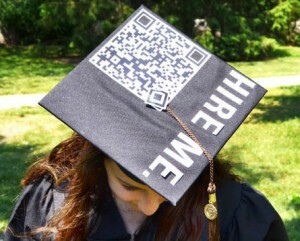 There are endless images on Pinterest of people with past graduation hats and ideas. If you need a little inspiration, I recommend you hit it up. 4. Stand Out – Even though many people may not even decorate their graduation cap, you could still get lost if people can’t read it. Clear messaging is crucial. Remember, people may be looking at you from hundreds of feet a way. So, don’t get into minutia and small details. If you want to impact the greatest amount of people, you need to pick a specific idea and make sure everyone can see it. Just view it as an early interview experience. Pretty soon, you want a job, right? Here’s a great test on how you have to think about getting people’s attention. 5. Compile Your Materials – Now is the time to get crafty. Your local home goods or craft store could hook you up with tons of crafts, beads, bejeweled accessories, etc. In my experience, I will also say that some of the best materials I’ve seen to get a message across is simply bright tape. 6. Practice on Paper – Flip your hat on a piece of cardboard or paper and trace out a practice copy. If you are going to get very decorative, you may want to give it a trial run before you mess up the one graduation hat you have. 7. Glue Guns, Yes. – Duct tape works for everything in life, including decorating graduation hats. But if you are going for a Level 2 decorating experience, then you may want to go after the glue gun. Caution! Glue guns get hot!!! Just be careful if you don’t normally use one. 8. Wear it Proudly – So, now you creation has come to life. Time to show it off. Wear it tall and wear it proud. 9. Throw that Sucker – Ok, you’ve sat through some mind numbing speeches and the ceremony. Time to move that tassle and toss that sucker in the air. If you want to keep all of your hard decorating work as a memory, just make sure you track where it lands! 10. Party – You’ve earned it. Nuff said. ← Senioritis. Senior Pranks. Senior Memories. Senior Rings. Hi there mates, its wonderful post concerning educationand fully explained, keep it up all the time. Glass Lewis & Co LLC leases 13,162 sf at 48 Wall Street. This stuff is very satisfactorily composed. The article was helpful to subscribers who exactly have a good value for articles. We look ahead for even more of the very same. He has detailed each and every little thing very beautifully and in brief. my websitе!I suppose its ok to use a few of yоur ideas! !